27 Superstocks put foot to floor as the green flag dropped for heat one. 555r Daniel Holland was immediately to the infield and out for the night. The race quickly developed into a three way tussle for the lead between 136b Maddie Wise, 3nz Adam Joblin and 85h Jared Wade. Wise would fall away from the battle leaving Wade to lead from Joblin. 23r Lance Ashton retired infield with a broken gearstick. The reds were activated mid-race to rescue 741a Craig Chatfield from turns one and two. 87b Thomas Stanaway made a run through the field but the story of the race was 52p Scott Joblin. From his rear grid, Joblin was in the bottom five after one lap. He would go ahead and destroy the field, clearly the quickest car on the track. 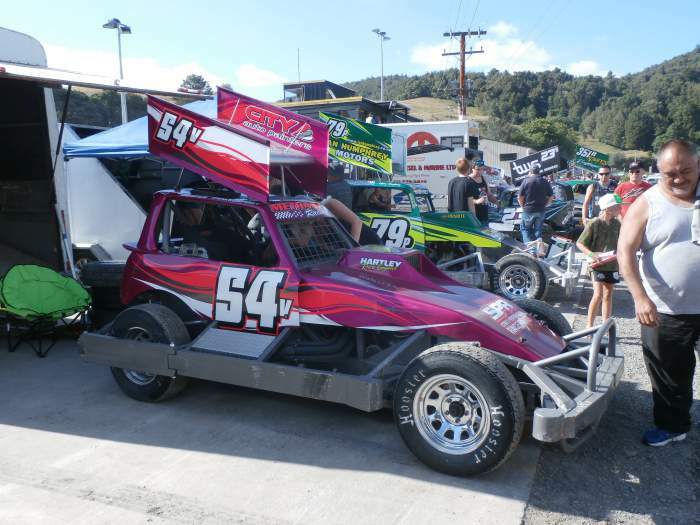 In carving his way through the pack Joblin set a new one-lap record for Superstocks on the new Huntly surface. Joblin was all the way up to third place with two to go and the way he was going the race win was within reach. Joblin popped a right rear tyre, hobbling home to finish 8th. Wade taking the win from Adam Joblin and 118r Bryce Steiner. 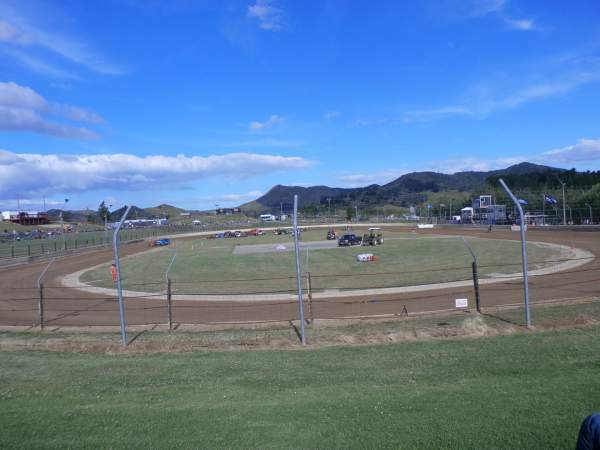 It was the turn of Stanaway to have his front grid in the second heat but he was unable to take advantage, spun in turn three during the hectic opening stages of the race. 3nz Adam Joblin cut a right front tyre on a track that was increasingly cutting up in turns 3&4. Joblin retired to the infield whilst back at the front of the pack Wade had worked his way through some traffic to take the lead. 29m Ryan Hunt had a good run without troubling the lead of the race. 52p Scott Joblin looked the goods once again and when the race was done only Wade was ahead of him on the track. 23b Wayne Talbot took an unassuming third ahead of Hunt and 118r Bryce Steiner. After two heats Wade had a perfect points haul of 54 but had his rear grid in heat 3. Steiner was six points back on 48 with a middle grid to come. Scott Joblin was on 46 but had the advantage of his front grid in the third heat. Behind those three Stanaway had recovered brilliantly to sit on 43 points. Then we looked back to 29m Hunt on 41 tied with 71h Tony Wootton who was flying under the radar. Please note points may not be 100% accurate. 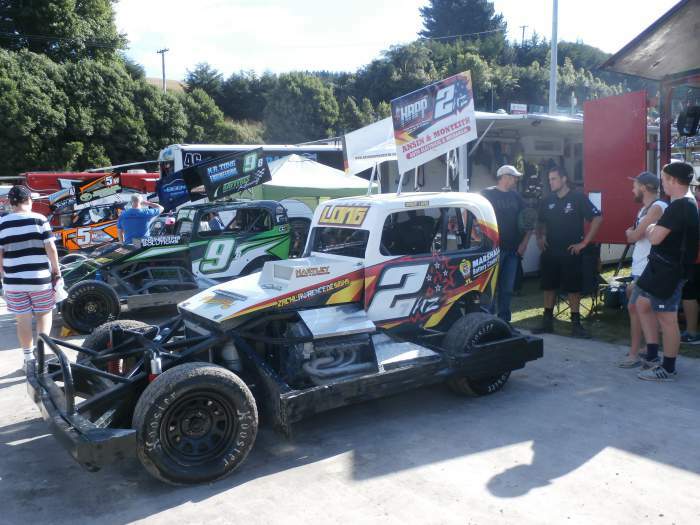 218h Aaron Alderton was starting right behind 52p Scott Joblin on the heat three grid. I thought he may be the man to put in the bumper but going through turns 1&2 on lap two it was 96h Scott Redfern who took Joblin to the wall. Joblin would escape quickly enough but fell well down the order. Meanwhile the stars were aligning for Wade. He was in the right place to avoid a multi-car melee in the mid-pack and crucially cleared 3nz Adam Joblin in the running order. 71p Shane Mellsop was the only other Palmy car in attendance but showed no interest in joining the physical side of the race. Given the circumstances it looked like race over but in speedway it's never race over and the pendulum was about to swing. As the race entered the middle stages the 3nz car came alive. He cleared the traffic between himself and Wade before reeling off a blistering lap to close the gap to the points leader. Adam took a lunge entering turn one, spinning Wade before holding him up mid-corner to further hinder his progress. Out of nowhere appeared Redfern who game Adam Joblin a punt up the backside and into the wall, releasing Wade. Only problem was Wade wasn't going anywhere, he was stranded! 52p Scott Joblin was once again a class above anyone else, making his way through the field with the sort of ease we rarely see in modern Superstock racing. In the latter stages Joblin stalked 71h Tony Wootton at the front of the field. In an intelligent move Joblin waited until the final corner to punt Wootton wide to take the spot and the chequered flag. I was a bit confused as I thought another driver was further up the track and Joblin had come second but either way it made no difference. Scott Joblin had won from Steiner and Stanway. Wade was pushed over the finish line by 13r Carlo Putaranui and I believe he was announced in 5th overall.